A man has been arrested on suspicion of the murder of a Blackpool teenager who has been missing for nearly 14 years. 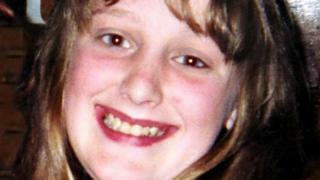 Charlene Downes, 14, disappeared on 1 November 2003. Her body has never been found. Police said a 51-year-old man, who lived in Blackpool at the time of her disappearance but now resides in Preston, is currently in custody. Charlene's mother Karen said "her heart was in her mouth" when police told her about the latest arrest and she had her "fingers crossed" for justice. She said: "I want closure and to know where she is. Not knowing is... horrible." Last month Mrs Downes said she was going to take legal action against the police who she accused of mishandling the case. It followed the release in November of CCTV images of her daughter on the day she was last seen. Ms Downes said the case could have been solved sooner had there not been a 13-year delay in releasing the footage. Charlene, who attended St George's School, was last seen on Talbot Road after she had been with a friend at the North Pier. Her mother said Charlene was a "typical teenager" who loved the boy band Westlife. She described her daughter as "bubbly, cheeky... and always happy". A man was cleared of Charlene's murder in 2008 after "grave doubts" were raised about evidence during his second trial. The jury in his first trial had failed to reach a verdict. In 2009 the Independent Police Complaints Commission (IPCC) said police evidence-gathering errors contributed to the retrial's collapse. The IPCC found strategic and tactical failure in the management of the material and several officers were disciplined. One was forced to resign in 2011, but the resignation order was overturned by a 2012 Police Arbitration Tribunal. 15:25 GMT: Charlene and her sister Rebecca walk along Bank Hey Street, Blackpool towards Coral Island amusement arcade. 18:45: The sisters see their mother who was handing out leaflets in Church Street. Rebecca goes home while Charlene stays with her mother and waits for friends. 21:30: Having returned home on Buchanan Street and then gone to another friend's house, Charlene goes to the Carousel bar on Blackpool's North Pier. 23:00: She heads back into the town centre and parts from her friend near the junction of Talbot Road and Abingdon Street. CCTV shows a possible further sighting of Charlene with a taller woman at the junction with Dickson Road. 3 November: Charlene reported missing. 11 November: Police appeal for information about the teenager. 23 November: Police say they have "growing concerns" for the teen who may be in Oldham or Denton, Greater Manchester, or in Wolverhampton in the West Midlands. November 2004: A year on, police said they were "hoping for the best, but fear the worst". March 2006: Her disappearance is treated as a murder investigation and two men are arrested on suspicion of her murder with a third held in connection with her disappearance. Police say more than 3,000 people had been spoken to by officers and almost 2,500 statements taken in connection with the case. May 2007: A 28-year-old man faces a murder trial, but the jury at Preston Crown Court discharged after failing to reach a verdict. 9 April 2008: At a retrial, the suspect is cleared of Charlene's murder while a second man is also acquitted of helping to dispose of a body. October 2009: The Independent Police Complaints Commission (IPCC) says police evidence-gathering errors contributed to the retrial's collapse. December 2011: A detective found guilty of two counts of misconduct following a review of the investigation by Lancashire Police, and forced to resign. 17 December 2012: Police Arbitration Tribunal overturns the findings and said the detective should be reinstated. November 2013: Memorial service for Charlene at St John's Church, Blackpool, on the 10th anniversary of her disappearance. 4 December 2014: BBC One's Crimewatch announces a £100,000 reward for information leading to the conviction of her killer or killers. 31 January 2015: Appeal made to Blackpool football fans at the Seasiders' match against Brighton at Bloomfield Road. 1 November 2016: CCTV released by police on the 13th anniversary of her disappearance of the last day she was seen. June 2017: Fresh appeal for information on her murder on BBC's Crimewatch Roadshow. 1 August 2017: Man, 51, from Preston, arrested on suspicion of murder.